Founded in 1934, Jacksonville University (JU) enrolls more than 4,000 students from around the world and is the oldest private master’s university in our region. On the banks of the majestic St. John’s River and minutes from downtown Jacksonville, JU is the place to customize your education, develop a lifelong passion, and prepare for a meaningful career opportunity. Come join more than 1,000 graduate students enrolled annually and see why JU is ranked a “Best Regional University” by U.S. News & World Report. Our alumni include admirals, mayors, film celebrities, award-winning novelists, pro sports players, university presidents, C-level executives, and many other smart, creative, and fearless individuals. Jacksonville University (JU) welcomes the smart, creative, and fearless, and may be the right place for you. Whether you began your educational journey with us or not, JU provides a lifelong commitment to students, both graduate and undergraduate, through academic excellence, opportunities for leadership and service, and access to full-service career resources. JU’s Davis College of Business is the only AACSB-accredited private Business school in all of North Florida and southern Georgia. There’s no better place to launch a career than in a city with a thriving business sector that includes Fortune 500 companies. Whether you want to pursue a master’s degree, executive master’s, or doctorate, the College of Business delivers high-quality, strategic programming and prepares graduates to succeed in the interconnected world of business. JU’s Brooks Rehabilitation College of Healthcare Sciences houses not only the School of Nursing but also the ever-expanding School of Orthodontics and the newly created School of Applied Health Sciences, a unique program that is poised to become the premier provider of health science education in the region. Northeast Florida is a prime location for the health care industry and is home to nationally recognized organizations like the Mayo Clinic, UF Health Jacksonville, St. Vincent’s Healthcare, Baptist Health System, and many more. JU’s College of Fine Arts educates tomorrow’s leading artists, innovators, choreographers, and entrepreneurs. Our program offers ongoing opportunities for performance and exhibition as well as personal and professional development. Our faculty are dedicated to their individual artistic disciplines, but they are committed first and foremost to the teaching and nurturing of each graduate student. JU’s College of Arts and Sciences offers rich territory to explore and is eager to help you become the next generation of leaders, whether in education, government, marine science, or the nonprofit world. 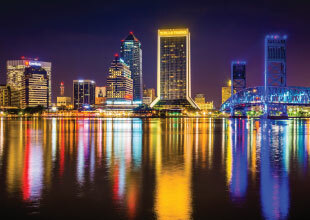 An investment in a degree from Jacksonville University is a smart one. According to the three major rankings on college return on investment (The Economist, PayScale.com, and US Department of Education College Scorecard), JU is among the top 10% of all public and private colleges and universities nationwide. We work closely with students to provide both the education and real-world experience that employers want most, equipping our graduates for long-term value. The JU Alumni Association ensures that commencement isn’t the end of your JU partnership. Join the ranks of approximately 29,000 alumni worldwide who will become your extended network of valuable contacts after graduation. Your access to this global community of Dolphins is only one facet of the active support our Alumni Association provides.